It’s hard to imagine a holiday party, wedding, or graduation party without worry. As the host, you want to make your guests feel comfortable, welcomed, and well fed, but you also want to keep your sanity, right? Offering a nice variety of tantalizing treats and wholesome food can help guarantee your guests feel right at home. However, instead of putting all that pressure on your shoulders, consider sharing the load with a catering company. You might be surprised at the many benefits they can provide. Buffets have a knack for making everyone happy. The guests can pick what they want and have as much as they want. You may be tempted to select a certain meal plan and let your guests serve themselves. But you might not be sure if all the guests like the selection. If you leave the choice to your guests, you’ll have a few less worries. What if the variety of food you want at your event conflicts with the preferences of several friends? Talking to your professional caterer about providing an area for your guests’ special diets won’t be a problem. You can even discuss the use of signs that describe what kind of food is what. Taking the time to do this will show your consideration in a wonderful way. Events always go best when everybody is getting along. 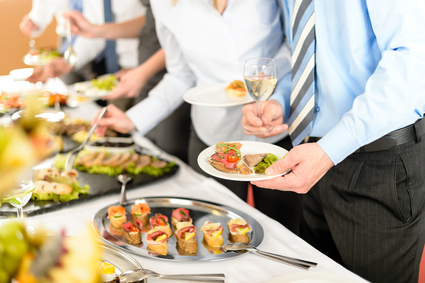 If a catering service offers a buffet deal, be prepared for social success. That’s because a buffet will get your guests out of their seats and talking with one another. Friends and family will usually travel in groups and maintain the excitement for digging in. If your event is more formal, a seating plan should be considered to prevent any social bumps that might occur. A professional catering service will help you achieve the atmosphere you’re hoping for. Whether it’s formal or informal, professional caterers can help you organize seating, offer staff to wait at tables, and even create a stylish menu while also preparing and serving delicious food. Some caterers also have connections to some wonderful event planners they’ve worked with before. This sort of professional advice will guide you to a fantastic, stress-free event. Believe it or not, a buffet may be the answer to any financial fears you have. Having a buffet service is like buying food in bulk: more food for less money. Professional caterers will be understanding of your financial needs and will ultimately want to make your event a memorable one. They’ll know what kind of food will fill up your guests without emptying your wallet. A professional Detroit caterer can take all of your worries out of the picture. You can prepare for the other things your event may need without having to worry about satisfying your guests with delicious food. Contact David Graham Events for your event or party, and experience these benefits for yourself.